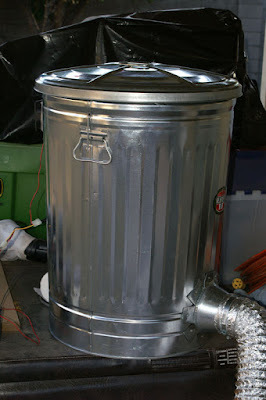 Way back when I first got into smoking meats, and before I decided to invest in a real smoker, I built the Alton brown Trash can Smoker. It worked so well I immediately purchased a real smoker. In preparation for smoking my BACON!, I converted it into a cold smoker. I went to Home Depot and purchased a second garbage can for $22.00. I had a long length of thin aluminum dryer tubing (never used) and some other parts. First thing I did was attach the Aluminum tubing and reducer to the new trash can at the bottom using pop rivets and duct tape on the inside. 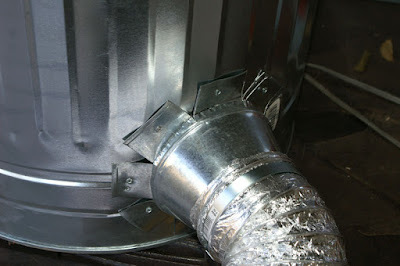 I Attached the ducting with a large hose clamp. 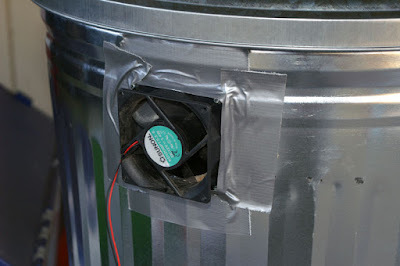 Attached a computer power supply fan to the top of the can on the opposite side. The finished can looks like this. 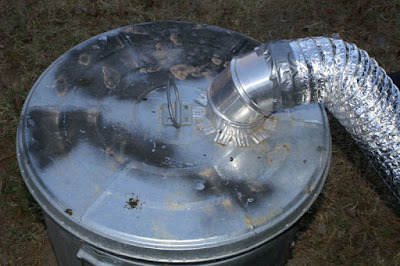 I attached the other side of the hose to the old smoker and duct taped it in place. I will be using a hot plate to generate the heat for the smoke. 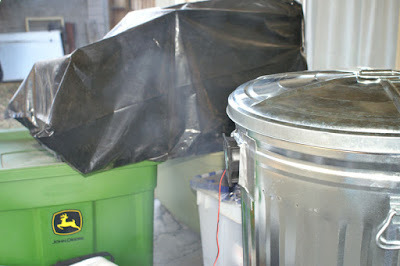 As a test I powered on the fan, lit some paper towels and put them in the old smoker. In a few seconds smoke came out. and after traveling through the long tube it was cooled by the outside air. Here is the results. Unfortunately I do not have the meat ready to smoke yet, so I will start curing it this Wednesday and smoke it on the weekend. The Once and Future BACON! Well..... After a long absence, I finally have something to blog about. I have been wanting to make my own BACON! for a while now, but I had to wait till the outside temperatures were low enough for cold smoking. That means I have a narrow windows of opportunity over the next month or so. Cold smoking requires temperatures of 70 degrees or less. Today I went to Hobe Meats at 6044 N 16th St, Phoenix, AZ and picked up 2 whole pork bellies (frozen, skin on). They were $4.99 per pound. Total was over $100.00 (if your gonna make BACON!, make a lot). I will be using the Alton Brown Cure for this, and will probably smoke them next week (once I build my cold smoker). Stay tuned.